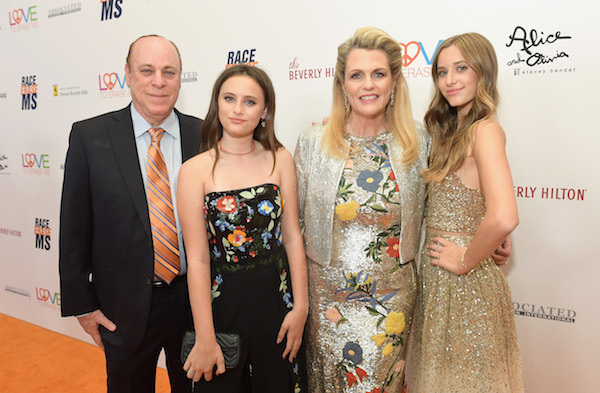 When members of the multiple sclerosis (MS) community contemplate the resounding success of the "Race to Erase MS," they automatically think about its vibrant and determined founder: philanthropist, jewelry and clothing designer, author, wife and devoted mom of five, Nancy Davis. The 2018 event in Los Angeles — in its 25th year — raised $1.6 million and since its inception in 1993, the Race has raised more than $47 million overall. The organization is dedicated to treatment and an ultimate cure for MS. The comprehensive reach of the event extends to its renowned Center Without Walls program, in which the top MS scientists from prestigious medical institutions such as Harvard, Yale, Cedars Sinai, and others conduct research and develop therapeutic approaches to treat the disease. Nancy, who also has relapsing-remitting MS, shared her contagious optimism for her work and for life in a phone interview with HealthCentral. She was at Disneyland with her children, ready to bravely board a roller coaster. HealthCentral: Nancy, the Center Without Walls is unlike any other center for MS — any that have walls! What a truly remarkable concept. Those who attended the Center Without Walls MS Forum, as part of the Race to Erase MS, had to have been exhilarated by what they saw and heard. Nancy: Reporting on the latest research is really important to those panelists who are in the trenches. Each doctor represents a different discipline within MS research. They share a database, and come together four times a year, so they never duplicate the same research. Two or three doctors don't need to do the same study. It's critically important to share if something doesn't work. Each study then becomes a stepping stone for another doctor to build on. When I was first diagnosed, there was no known cause, no drugs on the market, no cure, of course, and no hope. I was fortunate to get a second opinion from some of the best doctors, and a light went off in my head. What if we assembled the best and brightest in MS, but never spent any money on a building? Now I feel we're really close to finding a cure. I feel passionate that maybe it's only a few years away. HealthCentral: In your very educated opinion, what's been one of the most important recent breakthroughs? Nancy: Research around cell therapy is the most important finding. Among white blood cells, B cells are responsible for antibodies and presenting foreign proteins, while T cells produce additional immune responses. We know MS attacks occur when B cells and T cells interact — B cells actually activate T cells. We used to think only T cells caused MS, and not B cells. The newer medication, Ocrevus (ocrelizumab), approved March 2017, suppresses B cells so they don't activate T cells. It's given intravenously twice a year and the side effects are pretty limited. It works in 90 percent of people newly diagnosed with relapsing MS and has some benefit in a sizable fraction of patients with progressive MS. It took 10 years for approval because standards are getting tougher and tougher. HealthCentral: You are what some people define in 2018 as "crazy busy," but it's all good, right? Nancy: When I was diagnosed at age 33 in 1991, I had to go the homeopathic route, and I've continued to do that. I'm doing well and I want to keep doing what I'm doing. I never smoke or drink, and ingest no toxins. I try to lead a clean, pure life. I learned early on that MS compromises the immune system, so I can't afford to do things that make me sick. Actually, I'm pretty neurotic, so I do things to keep from catching a virus. I have no real MS symptoms at the moment and I'm so incredibly grateful. HealthCentral: It wasn't always this way, was it? As you say, in the beginning you didn't get such good news. Nancy: I was told I'd never walk again and now I want to call that doctor and give him a piece of my mind. Doctors are gods to many people, and their messages are very powerful, particularly the prognosis a doctor gives you. I'm lucky I didn't listen and that I went the next day and got a second opinion, and then a third and then a fourth. It's your life, and you have to challenge people, because you really do have only one life to live. You can't assume anybody knows your body better than you do. I remember going to the National Institutes of Health (NIH) and one of doctors was Dr. Henry McFarland — he's now head of my Scientific Advisory Board. You hold so much power in your hands. That's why I wrote my book, "Lean On Me, Ten Powerful Steps to Moving Beyond Your Diagnosis and Taking Back Your Life." So many people with MS never get a second opinion because they don't want to hurt their doctor's feelings. HealthCentral: Tell us about your artistic pursuits — oh, and other Race to Erase MS events coming up soon. Nancy: I design jewelry, called "peace & love," and sell it at SAKS (Fifth Avenue) and on evine, among other places. I've designed a special necklace and I'll be featuring it May 24 through 26 live on evine — the Loving Arc Collection — and I'll be donating a portion of sales to the Race to Erase MS. I also design T-shirts and I love doing it all. It really does let me express my creative side. May is also the "Orange You Happy to Erase MS Campaign" with select products helping raise funds for the Center Without Walls. I want to mention the "We Run the Grove" for June 3, a 13.1 mile run and 10K/5K in Los Angeles. HealthCentral: Thanks for sharing all the good going on for MS.
Stephanie Stephens is a very experienced digital journalist, audio/video producer and host who covers health, healthcare and health policy, along with celebrities and their health, for a variety of publications, websites, networks, content agencies and other distinctive clients. Stephanie was accepted to THREAD AT YALE for summer 2018 to author and produce an investigative series. She is also active in the animal welfare community.